Blakedale has expanded its fleet to include the Scorpion II truck mounted attenuator (TMA), the first MASH (Manual for Assessing Safety Hardware) approved TMA from the US. It is also TD49/07 approved in the UK, making it one of the safest and most reliable Crash Cushions in the world, Blakedale said. The Scorpion II, one of three vehicles that Blakedale will showcase at Traffex, will be fitted to an Iveco 18tonne traffic management (TM) vehicle, which also features a red X light arrow board. ‘We are proud to showcase the best of our expanding fleet. We have a strong heritage in providing vehicles that offer protection for road workers and the public and we’re excited to have the opportunity to discuss our fleet and services with the highway professionals who attend this important event for our industry,’ said Carmen Bowley, joint managing director of Blakedale. Visitors to Traffex are invited to visit the Blakedale stand (E060) to pick up a brochure and goody bag and to see more of Blakedale’s latest vehicles in the flesh including their 3.5 tonne TM vehicle with tail lift and 3.5 tonne low body TM vehicle. 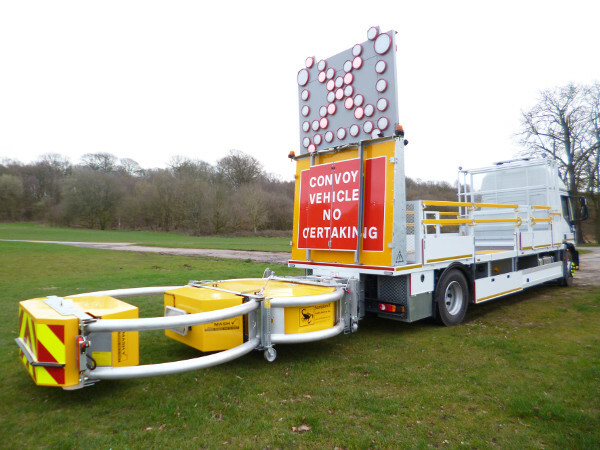 The firm said the Blakedale-designed 3.5 tonne low bodied TM vehicle (also known as the ‘Cone Ranger’) is ideal for the deployment of cones, signage and temporary traffic lights. The vehicle has an ultra-low bed height and payload of around 1300 kg. This allows operators to step on and off the working area quickly and safely, while removing the need for cone wells. All Blakedale TM Vehicles are equipped with the latest safety features and many are supplied with a recordable multi-camera system as standard. Blakedale offers these and other vehicles, including 18 tonne impact protection vehicle (with Red X and ‘Convoy Control Vehicle’ sign if required), self-contained mobile welfare units and general maintenance vehicles, for short and long-term rental, contract hire and sale. Traffex19 and Parkex 2019 take place from 2-4 April at the NEC, Birmingham. Both events are free to attend but visitors will need to register in advance.